Milwaukee Road Rotary X900215, South Tacoma, May 29, 1960. Still bearing her original builders plate - American Locomotive Company, Cooke Works, 8/06 - X900215 was converted from steam to electric drive in 1955. Conversion included taking out the boiler and drive gear, replaced by two GE traction motors, and adding a pantograph to the roof. While the plow could run the blade from overhead 3,000 volt wire, it proved to be more efficient drawing 600 volt juice from accompanying diesels. In all, there were four conversions, two assigned to the Rocky Mountain Division, and two, including this unit and her sister on the adjacent track, to the Cascades. 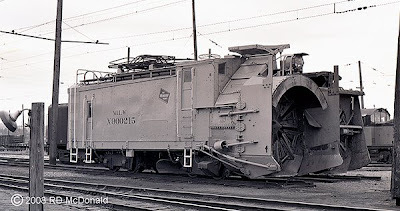 All other steam rotaries were scrapped in the ‘70’s. Found a shot of her hard at work! Any thoughts as to the oversize journal box?